CUTHBERT BEDE Autograph Letter Signed and Two Ink Drawings. Cuthbert Bede (pseudonym of Edward Bradley). English novelist and illustrator. Author of 'Verdant Green'. ALS. 3pp. Leigh, Worcester. November 2nd, no year . To "Dear Sir" [almost certainly Thomas Miller]. "The subject of your picture by West of Clifton struck me as bearing a resemblance to one of Westmorland's waterfalls for which I had made memoranda. You will perhaps be able to judge from the enclosed diagrams whether your picture is a Welsh or English subject. Of course if the Skelwith Force drawing had been taken from below the chief fall, the upper fall (which is at some distance) would have been completely out of view. I should have sent you the enclosed before this, but my sketch books were not at hand - as I have been obliged to turn out of my lodgings in consequence of the sudden death of my landlady. The day you gave me at Preston was a most delightful one, and I have to thank you for so kindly showing me the many sides of the place. Your pictures will long live in my memory - but your most beautiful pictures are your charming children. I hope that they and Mrs Miller are well. Have you read 'Verdant Green' the Second? I am glad to think that people consider it superior to the first part. They have sold the first edition of 10,000, and are now printing the 2nd edition. I hope 'Emily' has disposed of plenty of copies - give my love to her! I hear from Mr Rees that he was not able to take Preston in his way home. My account of your pictures has apparently made him much regret this. With compliments to Mrs Miller, Believe me dearest Sir, Very truly yours, Edward Bradley." 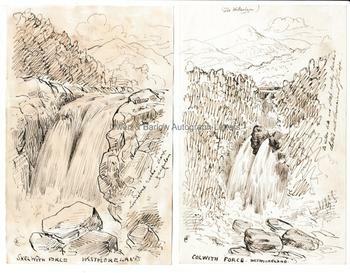 Together with his two sketches of waterfalls (Skelwith Force and Colwith Force) referred to in the letter. 8vo bifolium. 18 x 11.5 cms (7 x 4.5 inches). The second leaf (particularly the verso) very browned from old mounting paste, else very good. The two drawings, each 18 x 11.5 cms are in fine condition. Edward Bradley (who took the pen name 'Cuthbert Bede' from the two patron saints of his adopted town, Durham) had struggled to find a publisher for 'The Adventures of Verdant Green' but eventually it appeared in three parts. The first part was published in October 1853 and the 2nd part appeared in 1854, with the final part printed in 1856. The letter, therefore, must be dated 1854. By 1870 the one volume edition had sold 100,000 copies but the first editions of the separate parts are very scarce. The novel was a wicked and humorous lampoon of the life of an Oxford undergraduate with thinly disguised portraits of real people. Part of the novel's charm were the celebrated illustrations which were by Edward Bradley himself. 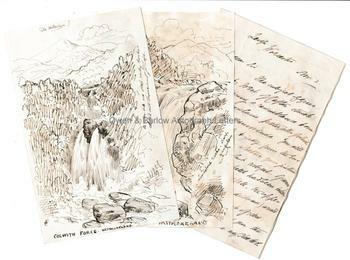 He was a skilled illustrator and draftsman (he was taught wood engraving be George Cruikshank), as is apparent from these rough sketches of Westmorland which accompany this letter. Provenance: From the 19th century album of Emma Marshall of Penwortham Lodge, Preston. Emma was the daughter of William Marshall, landowner and cotton manufacturer and was related by marriage to the Miller family of Baronets, MPs and landowners. Thomas Miller (to whom this letter is almost certainly addressed) was a noted art collector. His purchases had included Millais' 'The Peace Concluded' and other works. 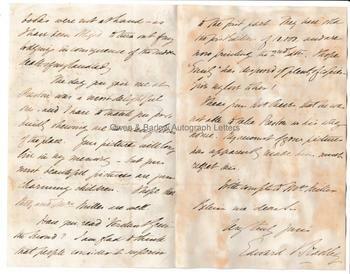 It appears from this letter that he was also the owner of one of William West's (West of Clifton) landscapes.